Showers should be an easy decision and installation. All you need is a shower tray, an enclosure and a shower head. Don’t forget the thermostatic values and you’re set to go. Showers offer convenience and many households prefer a shower because it’s economical and saves time and energy. If you have chosen to add a shower to your bathroom, chances are you’ve measured the space and have a clear idea on the shower tray you want along with the type of enclosure. Maybe you’ve gone for a modern walk in shower enclosure and a rectangular shower tray or a quadrant design if you have a smaller bathroom space to work with. It doesn’t matter what size or shape shower you have chosen, shower accessories can add to your showering experience adding further convenience and luxury. If you have chosen a beautiful large shower you don’t want to end up in the situation where you can only use one corner of your shower to get wet. The water should distribute with ease throughout the space, which is where shower accessories come into play. Shower arms are great shower accessories that can blend into your current bathroom design and match your shower head. You can choose between the cylindrical or cubed design to ensure your design flows throughout your showering space. The advantage to these shower accessories is that they lengthen the distance of the shower head, ensuring you can make the most of your large shower and enjoy a great showering experience. Shower jets are the luxurious shower accessories you can get that can turn your shower into a spa-inspired theme. The jets come in square or round designs to blend in with your bathroom offering you an invigorating showering experience and ensuring your entire body gets wet while you shower. It doesn’t get any better than this. These shower accessories can be added to existing showers or be included in new shower designs. They can give the bathroom that “wow” factor and ensure your bathroom makes a statement in your home. Shower accessories are designed to make your showering experience convenient and enjoyable, they are finished to the highest quality and complement the shower ensuring your shower always offers the very best showering experience. How Are You Installing Your New Shower Head? Showers have become such a popular choice offering convenience and functionality while saving you water. It’s a fact that showering saves water over using a bath and the average person will only take five minutes to shower, so it also saves you time. When placing a shower in your bathroom these days, you have such a selection available to you from the different shaped and sized shower trays to the various enclosures all the way to the shower heads and shower jets. Your shower head can be ultra modern or traditional and you can add that touch of luxury by incorporating shower jets, but do you know where you are installing your shower head? Wall mounted shower heads offer functionality and practicality, enabling you to place the shower head at your desired height, but once it’s up there is no moving it. You can get shower arms which come out of the wall with a movable elbow which allows you to move the shower head around to ensure that you get the most out of your showering experience. You will find many modern bathrooms will choose this option when mounting their shower heads. 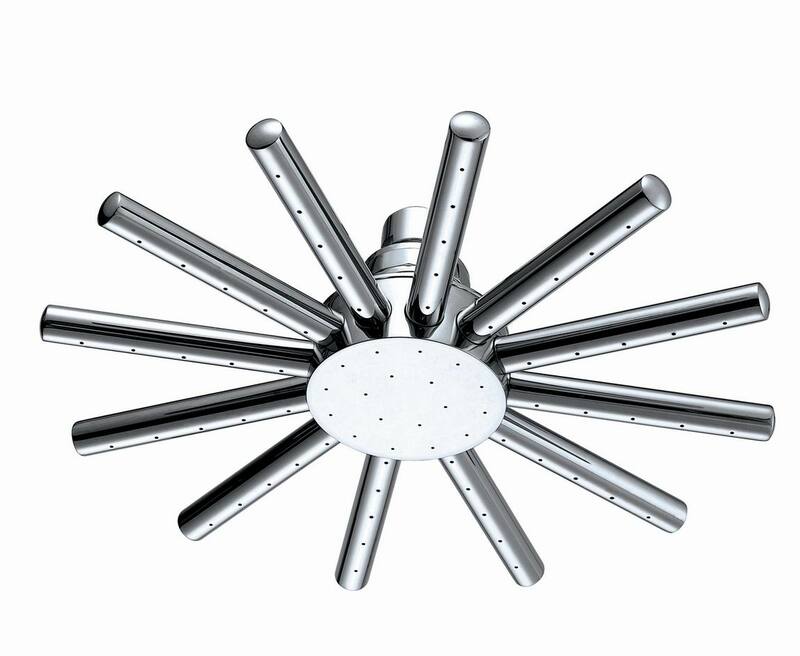 A large square shower head mounted to the ceiling looks stylish and sophisticated, but again there is no adjusting the height. While it may look great if your ceiling is high above the shower you may find that you don’t benefit from the full water flow. I can think of nothing worse than dancing around a shower trying to get the water to cover you when you’re full of soap. Slide rail kits offer ease of use, functionality and convenience. Unlike the wall mounting and ceiling mountings you get for your shower, these kits offer a rail which is mounted to the shower wall enabling you to adjust the height of your shower head. Slide rail kits are the perfect choice for family bathrooms where you have family members, all different heights using the shower. This enables you to adjust the shower head each time you shower to ensure you are getting the best showering experience. The slide rail kits come in a choice of designs to blend in with any bathroom design, whether you have a traditional or modern bathroom. Very often you will purchase a shower, shower enclosure and shower set but find that your shower doesn’t work for you. There is no reason you should just settle with the shower you have, there are many shower accessories you can use to make your shower your own, make it work for you. If you have chosen to rather place your shower head attached to the wall or ceiling over the slide rail shower system, then there are some shower accessories you will need. As you can imagine placing your shower head flat against your shower wall or ceiling will not give you the best showering experience. There are a few things you will expect from your shower, water pressure and most of all you want the water to reach you with ease. If your shower head is too high or at a strange angle on the wall, you will need to be a contortionist to enjoy the benefits of your shower. Using shower accessories such as shower arms or ceiling arms enables you to locate your shower head where you want it with ease. This ensures you have an enjoyable showering experience without any frustrations. Because you have had to choose a shower over a bath due to a smaller bathroom, it doesn’t mean you have to give up the idea of jets. You can buy shower jets for any shower offering your the luxurious showering experience that massages with a range of health benefits. These shower accessories come in two shapes to blend in with your current bathroom design. There is the round and the square. It’s so important that you ensure the jets you choose enhance your bathroom space. If you have an ultra-modern bathroom with plenty of square bathroom products including your shower head then choosing a square jet will work beautifully. The same applies to the circular ones, as you can imagine a square jet when everything else is round will look out of place. I never settle for what I have when I can make it better. You can spend hours working on your bathroom design and never be happy with your shower, using shower accessories enables you to make your shower work for you, enjoy the full benefits and enjoy the convenience and practicality of your shower without the frustration. Does Your Shower Work For You? I think one of the hardest things in a bathroom is finding the right shower to suit the entire family. When you are working with a family where everyone is different heights and ages, finding a shower that works can be a nightmare. You go and shower and the shower head is in the perfect position, but when your partner goes to shower the shower head is too low and then the children head to the shower and the water barely touches them because it’s way too high. It’s really difficult keeping everyone in the family happy when it comes to your shower, this is where slide rail kits come in, they are the solution to your problem. Once you realise that your shower really doesn’t work for you and your family, you can start looking at slide rail kits. I’m sure you’ve seen them before, they enable you to move the shower head up and down a slide rail to get it to the correct height, they are so easy to use and offer convenience and practicality. Just because you have realised that your shower doesn’t work for your family and are looking at slide rail kits for your shower doesn’t mean that you need to lose the stylish design of your bathroom. The slide rail kits are available in modern designs enabling you to find one that blends in with your current bathroom décor, that is stylish and elegant. This means that your can ensure your bathroom keeps its appearance and still enjoy the convenience that these rail kits have to offer. Who ever thought you would say those words, “I have taken control of my shower.” But in fact with the slide rail kits you are taking control, you are ensuring the showering experience is easy and practical for the whole family. These kits are easy to install and so easy to use, even the children in the family can manage the height adjustment with ease. Over and above being convenient and practical, they are stylish and will work in any bathroom design whether you have an ultra-modern bathroom or a traditional one. With so many great design choices available it is easy to find slide rail kits that will complement your bathroom. Many people don’t realise the amount of work that goes into a new bathroom or bathroom remodel. You probably think you’ll pop online buy a few items and once they arrive you’ll install them and your bathroom is ready. If only it were that easy, though with some DIY savvy you can remodel your own bathroom there are a number of accessories you should take into consideration such as your easy plumb and fast flow accessories. Yes I know you’re probably staring blankly at this page right now wondering what I could possibly be talking about, but when you plan your bathroom, you really need to take everything into account. Your easy plumb and fast flow bathroom accessories are all your waste fittings for your shower, bath and basin. Have you ever wondered where the water goes? If you’re having a bath and it overflows slightly the excess water escapes through an overflow pipe, but that water has to go somewhere, this is what these accessories are all about, they are all the additional accessories you probably haven’t thought about. If you have chosen a bath for your new bathroom, the easy plumb and fast flow accessory you will need should include a plug with overflow pipe, these are joined making them very easy to install and to ensure you don’t have any mishaps in the bathroom with an overflowing bath. For your basin you need a basin waste, somewhere for the water to go when you pull the plug. Plugs don’t come with most basins that you choose, so these easy plumb and fast flow accessories need to be chosen separately. The advantage is you can choose from the traditional plug with chain to the push system. I’m sure you know the plugs where you push it once to seal the plug hole and push it again to release and allow your water to flow freely. Choosing a shower for the bathroom has become a very popular choice as they save you on floor space and are a fast and convenient way to bathe when in a rush. The easy plumb and fast flow accessories for showers fit the standard shower trays and assist with the easy flow of water as you shower, ensuring the shower doesn’t overflow. They have a thick tube which offers the water a free flow to reduce any leaks or accidents.